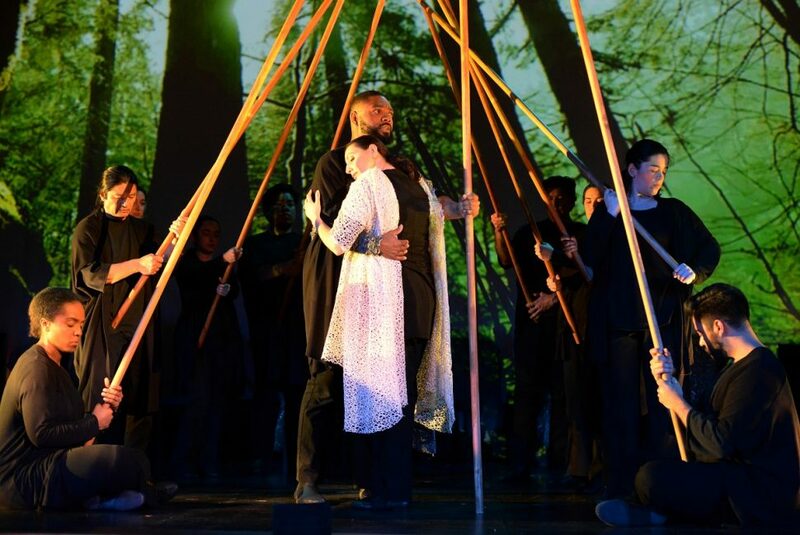 Photos courtesy of Long Beach Opera by Keith Ian Polakoff. Bernardo Bermudez as King Mark and Jamie Chamberlin as Isolde. 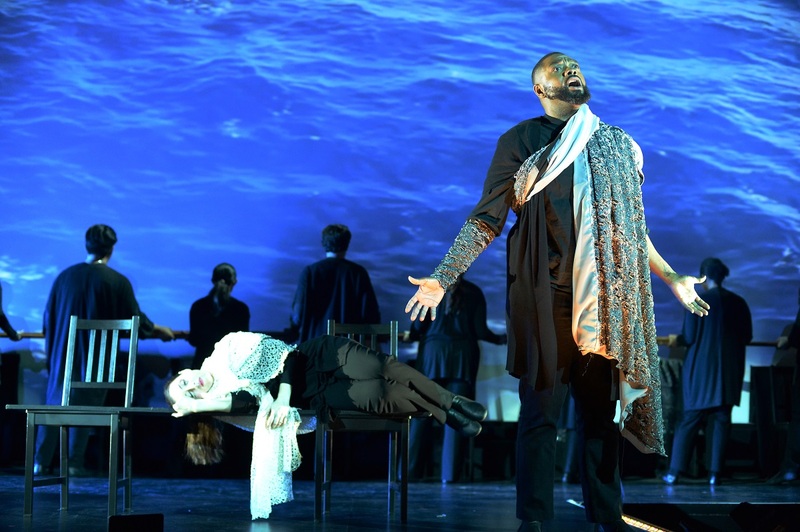 The Long Beach Opera (LBO) presented Swiss composer Frank Martin’s 1942 opera, The Love Potion (Le Vin Herbé), at Warner Grand Theatre in San Pedro on Sunday, May 13, a retelling based on historian and medievalist Joseph Bédier’s novel published in 1900, The Romance of Tristan & Iseult. 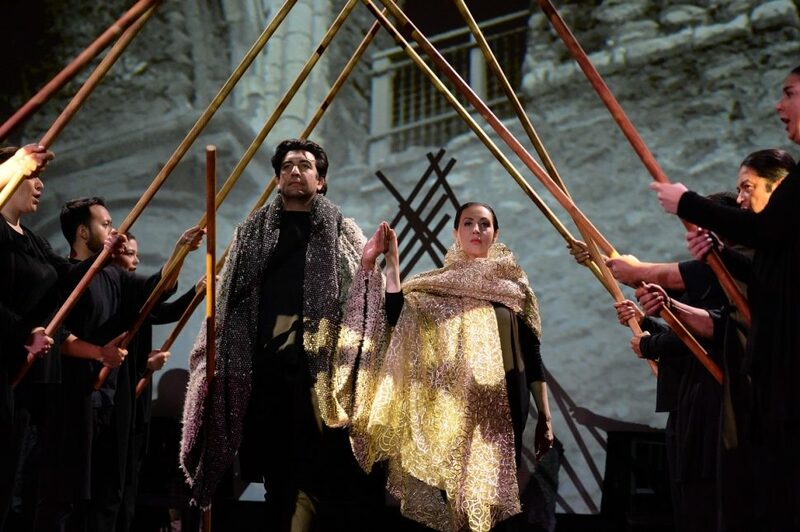 The production tells the romantic and tragic tale of knight Tristan and princess Isolde (Iseult, Yseult, etc.) as they mistakenly fall in love after drinking a love potion meant for King Mark and Isolde. The romantic tragedy likely influenced the romance of Lancelot and Guinevere, according to LBO. Jamie Chamberlin as Isolde and Bernard Holcomb as Tristan. A seven-string ensemble and piano conducted by Benjamin Makino supported the 12-person chorus. The cast sang in English, the lead characters’ astonishing attendees as their expressive voices and movements filled the theater. Tristan and Isolde were in love knowing that the potion had created those feelings. The audience was able to experience the mixed emotions they were also going through as they both embraced and attempted to push each other away. The chorus set the tone of the production with chilling vocals as they sung with lights beaming from underneath them, which gave a haunting look to their faces as if they were telling a scary story or relaying a warning. It was striking to see the shadows of the cast members standing be projected on the sides of the stage, as well. 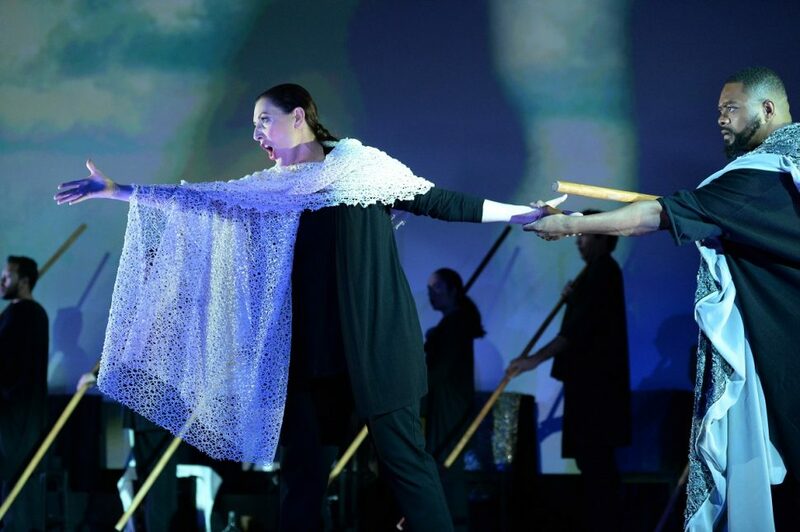 The cast members transitioned seamlessly from scene to scene using a minimal amount of props such as a board and sticks to represent swords, oars and a bed throughout the production to create various settings, including a forest, a shelter and the ocean. The cast members wore black costumes with colored drapes to differentiate between characters. Bernard Holcomb as Tristan and Jamie Chamberlin as Isolde with ensemble. The audience seemed to feel the shock and anger as audible gasps could be heard at the betrayal from Tristan’s wife Isolde of the White Hands as she tricked the lovers from meeting again. The story ended like how it began with lights illuminating under the cast members’ faces as they sung about love and received a well-deserved standing ovation. The Love Potion will have their last performance on May 19 at 7:30PM at Warner Grand Theatre. The production is two hours and 20 minutes with a 20-minute intermission. To purchase tickets, visit the link here. Warner Grand Theatre is located at 478 West 6th Street.